Samplers have been around for hundreds of years, with the oldest surviving ones dating back the 15th and 16th centuries. There were no printed patterns then, so when a needleworker found a design she liked, she would stitch it onto a piece of cloth—her sampler. The sample stitches might be sewn on individual pieces of fabric or all of them on one large piece, and the stitcher would keep her sampler, adding to it for the rest of her life. If you’re in the market to buy an old sampler, the first three pictures are ones I found on Ebay. English samplers of the 16th century were stitched on a band of 6" by 9" fabric. Since fabric was quite expensive, these samplers, known as band samplers, would be completely covered with stitches. They were highly valued, and often passed down through the generations. These samplers, stitched using a variety of needlework styles and threads, were often quite elaborate, incorporating subtly shaded colors, silk and metallic embroidery threads, and using a variety of stitches. The samplers also integrated small designs of flowers, animals, and geometric shapes stitched using as many as 20 different colors of thread. In the early 1700s, a border was often added to a sampler, and by mid-century, letters began appearing, as well as religious and moral quotes, such as “to be good is to be happy.” As a whole, samplers became more organized and decorative. By the time the 18th century rolled around, samplers were stitched more to demonstrate knowledge than to preserve skill. Sewing samplers was thought to be a sign of virtue, industry, and achievement, and girls were taught the craft from a young age. Samplers might include family records, Bible verses, and pictures of the seamstress’s home or church. The 19th century brought us samplers rich with symbolism and included trees of life, birds, flowers, and religious symbols. Red was the predominant color used by needleworkers, with complements of blue, brown, and green. Trees of life were usually stitched in red, and were a prominent feature. They symbolized the link between earth and sky, and represented life and hope. Other favorite elements of early samplers included flowers in pots, baskets, birds, hearts, crowns, and crosses. In the late 19th century, samplers became more structured. They were designed within framed borders and more attention was paid to symmetry. Borders also became fancier with elaborate floral designs. Alphabets grew more complex with fancy monograms, sometimes intertwined with flowers. Stitches used for samplers were mainly cross stitch, with backstitch and eyelet stitches sometimes used. 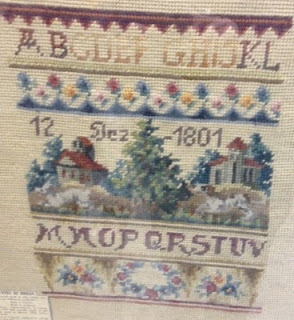 I snapped a picture of this lovely sampler at an antique show. I have several quilts that my grandmothers made, which I love, but I dearly wish I had a sampler from one of my ancestors had created. How about you? Do you own a sampler one of your relatives made? 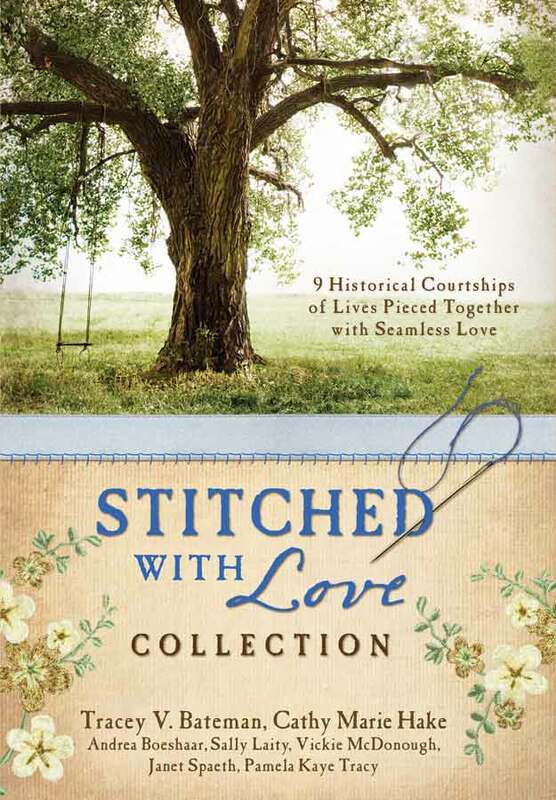 Speaking of sewing, I’m giving away a copy of the Stitched with Love Collection, which includes my Spider Web Rose novella, to one lucky person who leaves a comment today. This keepsake collection includes nine historical romances written by popular Christian fiction authors. Faced with finding the right fit in life and love, nine young women seek the courage to stitch together romance. But when unexpected obstacles abound, will love unravel before their eyes? Don’t forger to leave a comment to be in our daily giveaways! the only sampler I own is the one I made for mum for mothers day about 22 years ago (wow thats scarey) it was 1991. I have made some for a lady for her family and have used older patterns like the first one on this post. Have also done several for weddings. I dont have older ones but it would be cool to have one. I have a couple to do at present only cant with my wrist being injured. How cool it must be make samplers! I did some needlepoint and counted cross stitch work when I was younger, but I never attempted a sampler. That's so neat that you make them for gifts. Sorry to hear about your wrist injury. I had an MRI in the city on Wed and get the results this Wed. It actually isn't feeling as bad today so Im hoping its finally improving. Its also why I didn't comment much last week as I was away and little to no internet access and You know I didn't really miss it that much. I enjoyed the cross stitching and the different samplers. the biggest was a beatrix potter alphabet cos it was on small count and took 36o+ hours to make. I pray you get a good report on your wrist--or at least that the MRI will show the doctor how to treat it. That project you did sounds really pretty. Bethany, I'm not sure why, but my reply to your comment shows up below the next comment. I love to cross stitch but have always wanted to do a sampler. One of these days I will do it. I love Vickie's work and would love to win a copy of Stitched With Love so I can meet the other authors. Thank you for the opportunity. Thanks for your kind words about my books. I hope you do get to make a sampler one day. If you do, I'd love to see a picture of it. Sewing isn't for everyone. I don't like to do it all the time either. That's nice the you have two plants that were your grandmothers. This was quite interesting, I learned something today about something I would have never thought to learn. Thank you! Thanks for stopping by, Rikki. Sampler making is one of those things that's almost a lost art. playing with the younger children? :) I love looking at samplers, too, Mandy. So much work went into each one. That was fascinating! I've been sewing since a teenager and have made 6 quilts and finished my great-grandmothers and I didn't know that about the samplers! Thanks for sharing that, Vickie. I've always wondered about samplers. We don't hear much about samplers these days. It's sad, but there are so many other options these days for storing family records. That's so cool that you make quilts. You need to post some pictures some time. I don't have a sampler but I do have a quilt that my grandmother made and gave to me as a graduation gift. Thanks for the opportunity to win Stitched With Love. I would be so happy if I won this collection of stories. Old quilts are special. I have a couple of quilts that my grandmother and one my great-grandmother made. Hi Vickie, I didn't know the history of samplers. I don't have a sampler from any relatives, nor do I remember ever seeing one. Thanks for the chance to win a copy of you book. I don't have any samplers but do love them. Unfortunately I am not a crafty person. Wish that I was but seems like I have two left hands. Thanks for the chance of winning this book. Although i stitched alot when i was younger, and still have some cross-stitch kits, i never had or made a sampler. i knew they were to keep track of stitches that the stitcher knew, and from novels i read i gathered that later they were to show the talent or industriousness of young women, but never realized they had all those fancy threads back then already! Thanks for sharing! i would love to win Stitched With Love! (i have a quilt my great-aunt made especially for me, and a few i helped Mom stitch, as well). Thanks for the chance to win! I used to do counted cross stitch--before I started writing. That's so cool that you have a quilt that your aunt made. I have tried cross stitching but am unable to do it. I am not that talented - I will stick to scrapbooking and cardmaking. It would be nice to have a sampler from an ancestor as a keepsake. Thank you for the chance to win. My sister makes elaborate scrapbooks, and I'm so impressed with people like you who make those. They will be such a nice keepsake. Angela, I love scrapbooking, too and have several I've finished. They're a lot of fun, but time consuming. Made one for my granddaughter when she graduated from high school 9 or 10 years ago. Now I don't have as much time for it because of deadlines. Oh wow, Julie! That's so cool. I hope you'll bring it to WIN something. I'd love to see it. And I imagine it means all the more to you since you remember it from when you were young. I never knew that -- how interesting that the samplers evolved into artwork themselves..so cool. I enjoy the occasional cross stitch project but rarely find time to indulge. I learned a lot as I gathered info for this article too. I imagine with few things hanging on the walls way back when, the samplers were a focal point. truckredford at gmail dot com -- forget my email. Great Post! Thanks for sharing! Look forward to reading the book! I don't have a sampler, but your post reminded me that I do have (somewhere) a linen napkin on which my mother embroider the names and date of marriage of my great-grandparents. I need to find it and have it framed. Oh, what a keepsake, Kay! One of the quilts I have that my grandmother made, has a square for each of the states, and she embroidered the name, and state flower. The samplers are beautiful. I made one when we first got married, and hopefully some day someone will find it interesting. Thank you for offering this contest. I look forward to reading Vickie's book. That's so cool, Nancee. What all did you put on your sampler? I bet one of your ancestors will cherish it. There's nothing wrong with passing books around. And I'm glad to know you liked the cover of Stitched with Love. In each of the novellas, the heroine is working on a sewing project. I never understood why the artist put a tree on the cover. I learned to sew as a 4-H'er and crosstich as a college student. Now that we're missionaries that has been set aside. Would love to read this book! Thank you for your work as a missionary. That's such important work. Learning to embroider is one of my favorite memories of my grandma. My Dad's mom. I still have the little scarf with the flower I made for our dresser. Embroidery was a good way to teach eye/hand coordination. No, I don't, wish I did. I do have some quilts and crocheted things from my Great Grandma, she was born in 1918 and died in 2012, I really miss her. When I was first learning to cross-stitch it was Great Grandma who helped me, she provided the fabric and leftover thread many times. My Mom does have a little sign in a frame that Great Grandma made. That's awesome to have the skill you learned from your grandmother and the sign she made. That frame sounds really cool, DeAnna. I'm sorry you didn't receive any more of your grandmother's projects. I have a few things my grandmother's made. I enjoyed reading about all the things you've made. Those little girl dresses must have been darling. And it sounds like you might actually have a sampler--the oval stitched picture with your grandchildren's birth dates in it. Very cool! I've always enjoyed cross stitching and did stitch several bibs for my 5 children. Interesting article and i'm sure the stories in the books are just as interesting. I made a few bibs for my grand daughter when she was small. It was fun to stitch those cute pictures. Thanks for stopping by today. Great post. I used to cross stitch all the time, until my eyes decided to not let me. Now, when I cross stitch, it's just quilts that are pre-printed for cross stitch. Would love to win the books! I know just what you mean. I have several big cross stitch pictures that I made when I was younger, but I haven't attempted it cross stitch in years. 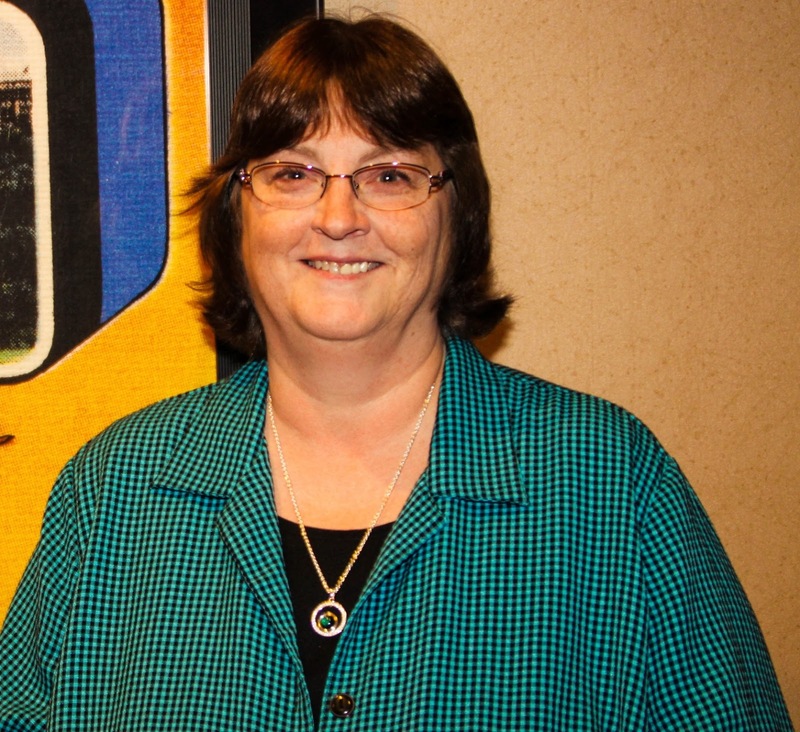 Congratulations, Debbie! Random.org drew you as the winner of Stitched with Love. Please go to my website (www.vickiemcdonough.com) to the Contact page, and there will be an email link where you can send my your address. Don't post it here. I hope you're enjoy the book!! Thanks Vickie! I sent you an email! I'm impressed that you'd tackle a king size quilt the first time out. That's a big job. I bet it's beautiful. I came back today to check on the Stitched With Love Collection! Yes, from start to finish, I enjoyed the process. A tidbit ~ It took me a year and a half to finish cutting, piecing, sewing ~ getting those points just right, quilting my "sandwich," squaring up the border, and putting the binding on. I love ***s! We were having our home remodeled and I only sewed on Tuesdays at our quilting gatherings. They had a lunch to celebrate! I learned so much and had fun doing it, and seeing what everyone else was doing. Our youngest daughter was the first to cozy under my "Sleeping Under the Stars" quilt. Smiling! She's coming to visit for Easter week. Her flight is an hour ten minutes. Our drive to the airport from our Missouri Ozarks hilltop home is two hours and nine minutes. We are going to take her to Lambert's for lunch ~ the home of the "throwed rolls." 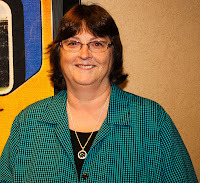 An interesting article on samplers, Vickie. My grandmother used to make quilts, but I had no knowledge about samplers. I love homemade stitched items! Thanks for the opportunity to win the book! Thanks, Bonnie! I love handmade items too, and I even collect quilted wall hangings and change them out seasonally. You can see pictures of them on my Pinterest site. I have quilts my grandmothers made, but not any samplers. I've made counted cross stitch samplers though I can no longer do handwork because of inflammation in my hands. I enjoyed the photos you shared, especially the one done by counted cross stitch. The book you are giving away looks like one I'd enjoy reading. I'm sorry that you can no longer cross stitch. I used to do that too, but it's too hard on my eyes now. I still have a few pictures that I made--no samplers, though. Great article. I was taught to embroider when I was a young girl, and I love hand work like this, but don't have time for it now. I once did a lot of counted cross-stitching and enjoyed doing it. I started one with Noah's Ark when Robert Mikell was born. He's 19 and the piece still isn't finished. I have some my aunt did that are really nice. Oh, and I did finish quite a few of them as gifts and for myself. My grandmother and my step-mother crocheted and I have several afghans they made. I have a number of old crocheted pieces and embroidered dresser scarves that belonged to my grandmother. She was born in the 1880's. Thanks for bringing back some great memories. That's neat that you have so many things your relatives made. I know they are special to you. As I've started shopping for antiques the past year, I've collected quite a few hand made doilies. Not sure what I'll do with them though. I don't own a sampler, but I love them. I made one years ago, I wonder if it's in my cedar chest. One of these days I'll have to look! I don't own any old quilts anymore, I did have a quilted throw made by my hubby's grandmother but we loved and used it to death! Thanks for the giveaway, and the article! You should dig out that sampler and get it framed, if you still have it. Maybe you can pass it down one day to someone who will love it like you did with the quilted throw. Thanks, Veronica. Novellas are quite a bit longer than most short storie. I think you'd enjoy them. I don't own any historical samplers, but they are what got me into cross-stitching. I grew up in the UK, and my family had National Trust membership. We spent a lot of time at historic homes, mostly in Yorkshire, and many had samplers on the walls. They'd often been stitched by a daughter in the family. Whenever I spotted one in a room I'd head straight for it. As a result, one year I received a printed long stitch kit for Christmas. I completed that fairly easily, but making the jump to counted cross-stitch took longer. I'd buy small kits but make huge errors in the counting every time. It wasn't until I was 22 that I completed my first kit and after that there was no stopping me! Weirdly enough, I don't like to stitch samplers. I much prefer to stitch designs of actual places. As a result, if a place we visit has a counted cross-stitch design of it I buy it and add it to my stash. Most recently, I picked up one of The Hermitage in Nashville when we were passing through in November. We didn't have time to tour the house or grounds, but I knew the store had cross-stitch kits and I was determined to get one! I love the idea of stitching pictures of the places you've visited. I wish I could see them. Counted cross stitch can be tricky, but it's worth all of the hard work. Unfortunately, most are still in their original packaging waiting to be stitched! I will have to dig out the few small ones that I have done, however, and put them on one of my Pinterest boards. What a great idea, Linda! A prayer sampler. That's a real treasure to have a sampler that your grandma made. Thanks for stopping by today! Instead, I took to knitting like a duck to water!! :) So far though, I am concentrating on my church's prayer shawl ministry, as much as I am finding specific projects that would bring a bit of cheer to my dearest of friends! I love being able to bring them a bit of handmade love!! I'm a bit more ambitious this year, as I'm attempting afghans, friendship shawls, and a hat, if I dare! My favourite sampler that you selected to show us was the 1889 one! Are those peacocks under weeping willows!? Is that one of your ancestors or an ebay find!? Thank you for offering such a keen bookaway! And, I look forward to your next posts in the coming months!! You're are really industrious, and what a neat thing to do. I'm sure the prayer shawls bless the people who receive them. I looked at the 1889 sampler again, and I can't tell for sure if those birds are peacocks. They might be. I found all of the samplers on Ebay except for the one in the black frame. I snapped a picture of it at an antique sale. I love doing cross-stitch samplers and every one that I make is "stitched with love". Thanks for the opportunity to win the book, "Stitched with Love Collection". I love your play on words. I'm glad to know you make samplers. It's becoming a lost art. I might have a sampler packed away, but I know I have a beautiful tablecloth. I think it was called tatting? I am not too sure, but its beautiful. I hope it gets passed down to each generation. When I got married, I bought some lovely hand-decorated notes cards that had pastel colored tatted flowers in one corner, which I used for my thank you cards. I just loved them and thought they made the 'thank you' a litte extra special. I bet your tablecloth is beautiful. Thanks to everyone who took time out of their Sunday to visit CFHS and read my article, and congratulations!! to Chaplain Debbie, who is the winner of Stitched with Love!! Debbie, I replied to your previous message, but in case you see this one first, please contact me via my website. Don't list your address here. Go to www.vickiemcdonough.com to the Contact page and use the email link there. Interesting information about samplers through the ages! I didn't know much about them. Thanks for the insight! I love novellas, thank you for the chance to win this one. I think all hand stitched projects are stitched with love. No samplers here at my house, but I do love the look of cross-stitch! My mom has always cross stitched. She always cross stitches a person's name for their wedding and a new baby. She also made my entire family's stockings for Christmas. A great post. Samplers were something I knew little about until your engaging article. Thanks. My father, yes, that isn't a typo, learned to embroidery while he was aboard ship in the Merchant Marines. He had several for Mom when he came back. He tried to get us girls interested when we were teens, but we didn't share his enthusiasm for the art. Wish now we had.